Abstract: Research has found a close relationship between the disease progression of diabetes and periodontitis. 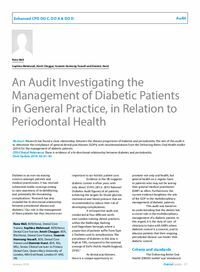 The aim of this audit is to determine the compliance of general dental practitioners (GDPs) with recommendations from the Delivering Better Oral Health toolkit (2014) for the management of diabetic patients. The final section of this article discusses the factors that affect the prognosis of immediate natural tooth bridges. Providing information on prognosis is an important part of the consent process; this includes patient factors and clinician factors. Clinical relevance: There is evidence of a bi-directional relationship between diabetes and periodontitis. Author notes: Rana Wali, BDS(Hons), Dental Core Trainee, Sophina Mahmoud, BDS(Hons), Dental Core Trainee, Amrit Chaggar, BDS, BSc(Hons), Dental Core Trainee, Yasamin Hamrang-Yousefi, BDS, Dental Core Trainee and Dominic Hurst, BDS, BSc, MSc, Senior Clinical Lecturer in Primary Dental Care, Queen Mary University of London, Mile End Road, London E1 4NS, UK. Objective: To demonstrate a method of quality improvement for management of diabetic patients in relation to periodontal health.